In this gorgeous villa you have a lovely panoramic view over the Amblève valley thanks to the grand, large windows. You will completely relax in the lovely wellness area with jacuzzi and sauna. The luxurious bedrooms all have stylishly decorated adjacent bathrooms. 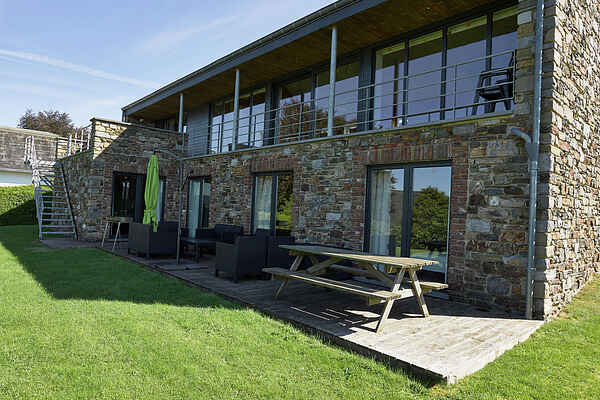 The holiday home is built in a very special building style, making use of modern as well as classic materials, such as natural stone and wood. Combined with the large windows and all that comfort, you will still feel one with nature. The lovely terrace and the large garden overlooks the Amblève valley and also gives you access to the communal volleyball field and the three jeu de boules courts. Your relaxation is guaranteed since the holiday home is quietly situated at a dead end street, though you are only 300 meters away from the center of the village. You are in the heart of a beautiful, hilly region of Belgium with lots of sights and activities such as hiking and mountainbike routes. The waterfalls of Coo and the caves of Remourchamps are worth a visit as are Plopsaland Coo, the circuit of Spa-Francorchamps and the town of Spa. If you visit the villa during the winter months there are some lovely ski and cross country ski pistes in the area.